Spencer Mills of Marysville goes up for a basket on Tuesday at Dublin Scioto. The Monarchs fell, 60-54. 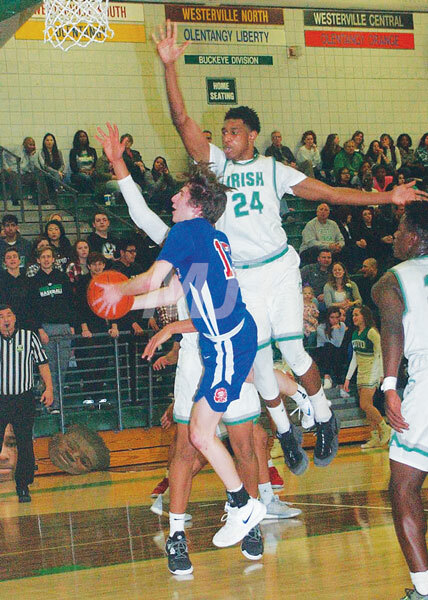 Dublin Scioto began draining three-point shots and taking advantage of Marysville turnovers during the third quarter on Tuesday. “They made their three-pointers and we didn’t make ours,” said MHS coach Ryan Grose after a 60-54 setback on Scioto’s home floor. The Monarchs played a solid game during the opening half. The ball movement was swift and sure as the Monarchs found numerous teammates for baskets. Bodie Eberhart fed the pumpkin to Phillip Hughes as MHS (8-12) grabbed an early 6-2 lead. The Irish suffered through several empty possessions on errant shots or turnovers. Eberhart racked up two more assists on buckets by Hughes and Spencer Mills. Jayden Prince and Zack Gawronski, however, knocked down three-balls as Scioto pulled to within 12-10 to end the stanza. Jack Christian buried a pair of trifectas and scored on Eberhart’s assist as the Monarchs (who will host Hilliard Davidson on Friday) climbed to a 20-13 spread. Marysville maintained leads of four-to-six points over the next several minutes. Ben Lombardo sliced into MHS’ advantage with a three-ball that narrowed Scioto’s deficit to 27-23. Gabe Schaeffer’s jumper pushed the Monarchs out to a 29-25 lead with 90 seconds left in the half. The Irish coughed up the ball, but Marysville tossed up a shot that failed to find the mark. Scioto played for the final shot of the half, but missed the effort at the horn. A three-pointer by Gawronski tied the score at 30-all nearly two minutes into the third quarter. Prince followed suit to give the Irish their first lead of the night at 33-30. Garrett Taylor scored on the low block as MHS later pulled to within 34-32. The Monarchs came up with several empty possessions over the next few minutes. In the mean time, Lombardo and Gawronski drilled three-pointers as the Irish climbed to a 40-32 lead. Free throws from Drew Bryant and Dupreis Owens staked Scioto to a 43-32 margin with two minutes left in the quarter. A pair of shots from the charity stripe by Eberhart pulled Marysville to within 43-34. Prince, however, split his way through Monarch defenders for a shot off the glass and a 45-34 Irish lead. Christian sank two from the charity stripe to narrow the gap to 45-36 by the end of the stanza. Gawronski converted a steal into a layup and a 47-36 Irish lead to begin the final eight minutes of action. Christian knocked down another three-pointer, but a number of turnovers thwarted MHS’ offense. Eberhart tallied five quick points as Marysville closed to within 49-46 with approximately three minutes to play. Prince gave Dublin a bit of breathing room with a trifecta, one of nine on the night for the Irish. Mills hit a basket to cut the margin to 52-48. At that point, the Irish began to take the air out of the ball in order to burn the clock. As such, the Monarchs had to foul in order to preserve time. As with any game of this nature, the free throw line was extremely critical down the stretch. The Irish made the best of that situation, as they went 10-for-10 from the stripe during the fourth period. Their work from the stripe led to a 59-51 lead with 14.5 seconds to play. Joey Duke swished a three-pointer to whittle the deficit to 59-54. MHS then burned its final timeout with 6.5 seconds to play. Once action resumed, Gawronski was sent to the free throw line for the double bonus. He made one shot for a 60-54 lead. The Monarchs missed a long three-point attempt at the final buzzer. “We had too many unforced and careless turnovers and that was disappointing,” said Grose. “Those are things we go over in the film room and during practice. “We just continue to hurt ourselves. “You can’t do that against anybody and expect to win,” he said. “We just have to learn to make better decisions. Gawronski 8-1-21, Prince 5-3-16, Ownes 1-8-10, Lombardo 3-0-8, Bryant 1-2-4, Mwamba 0-1-1. Totals 18-15-60. Three-point goals: Gawronski 4, Prince 3, Lombardo 2. Eberhart 6-5-17, Christian 4-2-13, Taylor 3-1-7, Hughes 3-0-6, Mills 2-2-6, Duke 1-0-3, Schaeffer 1-0-2, Brown 0-0-0, Siefring 0-0-0. Totals 20-10-54. Three-point goals: Christian 3, Duke 1. MHS’ jayvees beat the junior Irish, 48-33. Gabe Powers led Marysville with 15 points. The Monarch frosh also downed Scioto by a 53-36 count. Kade Focht, Josh Lim and Gavin Rohrs each tallied eight points.